For the second time this month, Soundings brings you ravishing sounds from beyond the norm. Each event is an eclectic mix of live performance, multi-channel playback and interactive media, in a lovely environment perfectly suited to careful listening. Join us at St. Munchin's Church, a venue half-gothic and half-romantic, for our featured guests from the UK, Diana Simpson and Manuella Blackburn. They will be performing both individually and in their collective guise The Splice Girls, famous in Manchester are beyond. Joining them will be the duo of Paul Hegarty and Vicky Langan, performing together for the first time anywhere as La Société des Amis du Crime. And also local composer Stephen McCourt. Full details are on the Soundings website. This concert is presented in cooperation with the Tweak Festival. It is bound to sell out, so get there early if you want a seat! 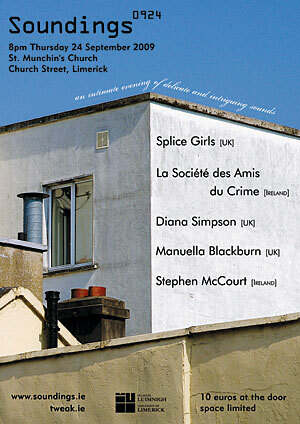 Soundings is curated by Robert Sazdov and Robin Parmar, with support from the CCMCM at the University of Limerick.